Check out the last two episodes of the web series before the full two-hour pilot airs on Syfy next year. Luke Pasqualino and Ben Cotton star in this web series set during the first Cylon war, directed by Jonas Pate. Jonas Pate directs this web series starring Luke Pasqualino and Ben Cotton. Luke Pasqualino and Ben Cotton star in this sci-fi web series set in the middle of the first Cylon War. Luke Pasqualino's William Adama uses a reckless technique to get out of a firefight in this scene from the web series, debuting November 9. The Syfy pilot will be split up into web series episodes debuting Friday, November 9 on the Machinima Prime YouTube channel. Holy frak. Follow young pilot William Adama in the First Cylon War and his first adventure aboard the Battlestar Galactica. This two-hour Syfy pilot is set during the 10th year of the Cylon War and stars Luke Pasqualino as a young William Adama. 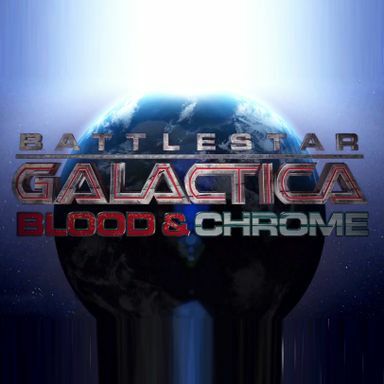 Battlestar Galactica: Blood & Chrome takes place in the 10th year of the first Cylon war. As the battle between humans and their creation, a sentient robotic race, rages across the 12 colonial worlds, a brash rookie viper pilot enters the fray. Ensign William Adama, barely in his 20’s and a recent Academy graduate, finds himself assigned to the newest battlestar in the Colonial fleet… the Galactica. The talented but hot-headed risk-taker soon finds himself leading a dangerous top secret mission that, if successful, will turn the tide of the decade long war in favor of the desperate fleet. “The ‘Galactica’ universe as re-imagined by Ron Moore and David Eick is rich with possibilities and backstory,” said SyFy's Mark Stern.